When God gives us a glimpse of a calling He has for us, it can be an exciting time as we take time to prepare and transition into that calling. The problem is, sometimes, we just jump into our callings without taking the time to prepare, pray over, or think through what we’re doing. I know I’ve been guilty of this! So if God’s been tugging at your heart and telling you He’s got something for you to do, take this quiz by reading the questions and answering yes or no to see if you’re really ready to pursue your calling, or if you need to put the brakes on and do a little more reflecting and preparing first. I’ve even included some bonus tips and bonus questions to help you along! #1: Have you thought about any and all changes that will need to be made to your lifestyle, relationships, mindset, habits, routines, finances, location, etc. as you transition into your calling? Every calling - whether situational, seasonal, or lifetime - requires at least one small change, if not several big changes. It’s wise to think through how your life will be different if you pursue your calling so there aren’t a lot of surprises or hiccups for you down the road. #2: Have you thought about what you may have to drop, stop, or sacrifice in order to pursue your calling? Just like starting a new chapter of a book means you’ve finished the previous one, starting a new chapter of life means you’re leaving behind some things, people, locations, etc. in order to make room for the new. Taking the time to think through (and pray over) what you might have to give up or leave behind is an important step to take as you prepare to pursue your calling. #3: Are you ready to make the necessary changes? Thinking about what you’ll need to sacrifice or change is one thing, but actually being ready to make those sacrifices or changes is another. Bonus Tip: If you can’t answer with a definite “yes” on this one, I must be honest and lovingly let you know that you’re not ready to pursue your calling yet. #4: Have you discussed your calling with your loved ones and shared with them what changes your calling would entail? As mentioned earlier, if our callings affect other people in our lives, they need to know. This also gives them the opportunity to pray for you and with you about your calling. Bonus Question: If you’re married, is your spouse being called in the same direction or in agreement with your calling? Again, if the answer is “no”, then it’s not time to pursue your calling until you’re in agreement. #5: Have you prayed about it? You may think this one is a no-brainer and be tempted to answer “yes” without thinking, but take a moment to really reflect on how much time you’ve spent praying over your calling, as well as the mindset and heart attitude you had while praying. It can be so easy for us to go to God, tell Him about our dreams, and then walk away without taking time to listen to His dreams for us. Bonus Question: Did you spend time in prayer and fasting (especially if it’s a seasonal or lifetime calling)? This practice can be a really great way to focus on God’s calling and to hear from Him more clearly by removing distractions. Bonus Tip: Fasting doesn’t have to be giving up food. When I feel the need to listen to God through fasting, I always ask myself, “What’s the one thing I can’t give up?” and then I know what I need to fast from. Obviously, I don’t mean I give up things I need to live; I mean I give up things I think I need: social media, dessert, TV time, etc. #6: Are you obeying God right now in your current calling? Pursuing any God-given calling starts with obedience. If you’re struggling with obeying Him in the situation, season, or calling He’s got you in right now, you’re going to struggle with obeying Him in your new calling as well. So before you pursue your calling, be sure your heart, mind, and actions are obedient right now where you’re at. If not, you’ll carry that spirit of disobedience into your new calling, and you won’t be able to fully fulfill your calling, and if I may add some insight from my own experience, you’ll also be pretty miserable. #7: Have you surrendered your calling to God? You may be thinking, “Isn’t this the same as #5?” but it isn’t. We can very easily pray over something without surrendering it. When we surrender something, we let go of it completely. It’s no longer ours to possess or control. Surrendering our callings means we leave them in God’s hands, and by doing so, we are acknowledging that He is the one who either allows us to stay in our current calling or takes that calling away and gives us a new one. 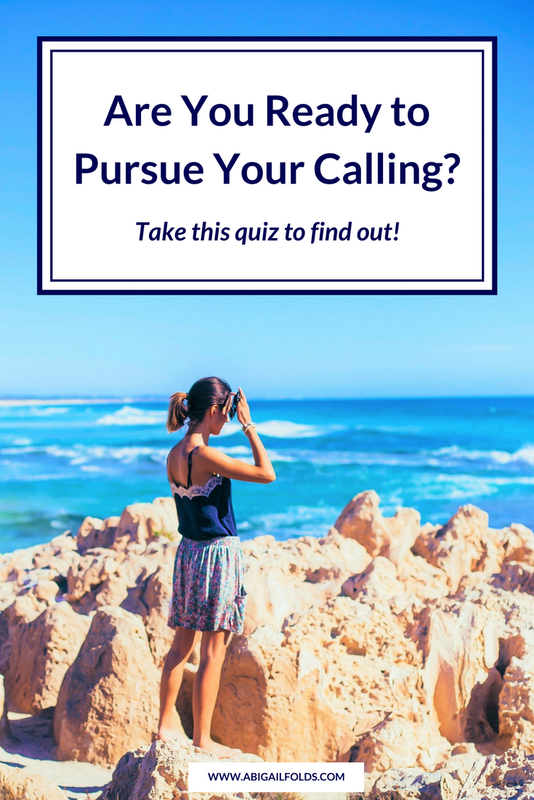 Bonus Tip: If you want to ace this quiz and be ready to pursue your calling, think over every aspect of your calling and spend time surrendering each one. #8: Has God given you the green light? If you’ve answered “yes” to every question on this quiz but have to answer “no” to this one, it’s time to slow down and hit the brakes, my friend. It’s so tempting to rush ahead and jump into a new calling without first checking to see if God’s giving us the thumbs up or the wait signal. Sometimes, He tells us about a new calling but asks us to wait before we pursue it. Usually this is to prepare us more for the calling, but sometimes, He needs to prepare the calling for us. Either way, if He’s not given us the okay to move forward, we need to wait. How did you do? I hope this quiz was helpful as you’re praying and preparing for your wonderful new calling from the Lord! Think of it as your ultimate cheat sheet for all things callings! And if you’d like some 1-on-1 support as you’re figuring out and transitioning into your calling, I’ve got you covered. Click the button below to read more about how we can work together on your journey.